At Vopak terminal Botlek in Rotterdam, management faced an interesting challenge. One of the tanks storing benzene had a cone roof ready for replacement. Where nowadays often the complete tanks get replaced, Vopak challenged tank specialist Mercon if a sole cone roof replacement would be possible with the aim to save costs and to avoid wasting material as the tank itself was still good. And of course with minimal impact on the operations of the terminal. 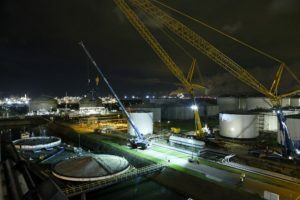 Some extra challenging factors in finding the right solution were the fact that Vopak’s terminal Botlek is quite a busy terminal and that this 20m diameter benzene tank was located in a tank pit with 14 other tanks. This meant that no fuel transfer of the other tanks would be possible in case of hot working activities on the benzene tank and thus limiting Vopak’s customers’ operations. The manufacturing of the roof off site seemed to be the best choice as this would least hinder daily operations at the terminal. But the lifting and installation of the roof would be quite difficult as the tank pit is 110m distant from the quay side making lifting operations not very easy. How all challenges were overcome you can read below. If you can lift a prefab roof from the water and install it onsite, this is the most cost effective solutions you can wish for. And giving the least interference on the terminal from an operational side. Thus, first Mercon investigated if such a lifting operation would be possible. Usually for a roof of only 25 tonnes, no heavy crane is needed. However, to overcome the 110m distance, a heavy crane would be necessary. In the end the solution was found in two heavy cranes of 700 and 750 tonnes respectively with an outreach capacity of 65m. By placing them on a road in between the tank pit and the quay side, the lifting operation would be possible. Now the lifting part, was tackled, it was further investigated how to build the tanks offsite in the best technical and most economical way in order to comply with Vopak’s wish for cost efficiency. In the choice how to build and replace the cone roof also the prerequisites for safe transport and installation were taken into account and the EN14015 norm which means tolerances of maximum 2mm. Mercon suggested to carry out the structure of the new roof in a different manner. Whereas the current cone roof was built with trusses, Mercon advised to carry out the new structure with roof beams. In the past often cone roof constructions were based upon trusses as the structure is lightweight and thus saving on material costs. Disadvantage of this typical construction is the high labour intensity. With labour being more expensive today, a cone roof construction with roof beams is a more economical option. In order to keep the roof stable during transportation and installation Vopak and Mercon decided to have a 60cm ring attached to stiffen the tank roof. The benzene tank would then be cut 60cm under the roof. The roof and 60cm of tank ring could then be lifted off by the cranes and subsequently replaced by the new construction. In order to secure a perfect fit between the existing tank shell and the upper ring which was attached to the new roof, accurate measuring was an absolute prerequisite. Furthermore, the manufacturing process had to be carried out with utmost precision. Mercon first levelled a ring of sand at the Kinderdijk yard where the cone roof manufacturing took place. Next a steel plate was laid on this ring of sand as a sort of foundation for building the roof as accurately as possible. Next to all roof sections, a 60cm upper ring and amongst others the cooling system was preassembled and build together. 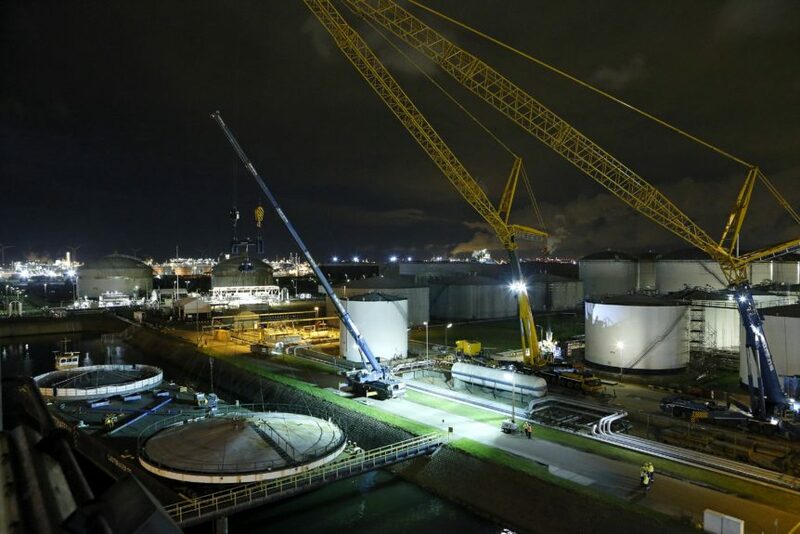 Simultaneously at Vopak’s terminal Botlek, the cutting of the tank wall 60cm under the roof took place. Part of the tank wall needed to remain uncut until the cranes were at site for the lifting operation. Otherwise it could fall down due to wind loads and the shell would be unstable during the time that there was no roof on the tank. It is possible to cut the ring by robot but it is better to do it by hand. A robot suffers from vibration in the tank shell, caused by local stresses and because of that the cutting line is not very neat. It takes craftsmanship to make the perfect cut. Another advantage from manual cutting is the possibility of bevel cutting enhancing better welding possibilities. The new cone roof was shipped from Kinderdijk to Vopak Botlek by barge. At night, in only eight hours’ time, the lifting of the old roof and placement of the new roof were carried out. The 60cm upper tank ring was fixed to the tank wall on a certain number of points, making it a stable construction. Then the cranes could already leave the terminal. By having two shifts working on the tank, in only two weeks’ time all equipment such as cooling system, piping and auxiliary equipment was installed.